All bulk products such as topsoil, mulch, stone, sand and boulders are available for delivery. The delivery fee is a flat rate fee in addition to the cost of the products purchased and is dependent upon where you are located. There is a delivery fee associated with each load delivered. Please call for a quote on delivery to your location anywhere in southwest Michigan. The maximum capacity for heavier materials is limited by the total truck weight. The maximum load size for lightweight materials is limited by the truck size. The maximum per truck load is 22 cubic yards of mulch, 15 cubic yards of topsoil, or 12 yards of stone per delivery. We do have semi-trucks which can haul more material per load, although these trucks are limited to operating only on larger commercial sites. Same day deliveries are sometimes possible, call to see if there is same day availability if a last minute need comes up. It is best to schedule your deliveries a day or two in advance, especially if approaching a spring weekend. In spring time we often do fill our schedule up for the next day, so giving us 2 days’ notice is always safest to ensure availability for your desired time slot. Before placing your order it is best to consider where you would like the load dumped. Obviously the closer it is to where you are using it the less effort it will take to install the product, but the higher likelihood that repairs to lawn, landscape or driveway may be required. The following are a few things to consider when choosing possible dump locations. 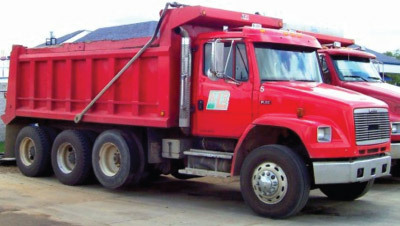 Single, tandem and tri-axle trucks dump trucks are used to make bulk soil, mulch and stone deliveries. These trucks are large and when full weigh 28,000, 48,000 and 54,000 pounds respectively. Driveways are the most common dump location since they are easy to shovel off from, clean up, and keep the heavy truck off lawns and landscaping. The truck will leave ruts if driven off pavement or driveway. New cement driveways or driveways without sufficient base material are quite susceptible to cracking or breaking. Wires and trees can limit dumping locations since the dump bed goes very high when dumping. Consider how many cubic yards of material is needed and what the weight capacity of your truck or trailer is. In general, most small pickups have a weight capacity of about 1000 to 1500 lbs. Which means if you are getting soil or stone in a small pickup, 1/3 to 1/2 a cubic yard will be a good load. Full size pickups usually have weight capacities of 1500 to 2500 lbs, so a ½ cubic yard to ¾ of a cubic yard soil or stone is typically a safe load maybe a yard if it is a heavy duty truck. Bulk products such as stone and topsoil are deceptively heavy. Soil usually weighs 1800 to 2300 lbs per cubic yard. Stone weighs in at 2600 to 3000 lbs per yard. How much can my pickup truck or trailer safely haul? Will it be an advantage to back my pickup truck or trailer to where I need it versus a dump truck? How much time will it take to clean the material completely out of the bed/bumper etc. of the truck? Is it worth the wear & tear on the vehicle? Hauling bulk materials is best accomplished by using to open pickup truck beds and trailers. Enclosed vans and SUV’s are OK to haul a few tubs, or buckets of bulk material, but shoveling stone, mulch or soil directly in the back of such a vehicle makes a mess. Your pride and joy pickup truck is going to get dirty and will endure some scratches in the bed when you use it to haul materials. If you are meticulous about your truck the cleanup of bark, soil and stone can take a while. If you have a trailer with a very old undercarriage consider the problem involved if the axle breaks while on the way home while hauling 2000 lbs worth of bulk stone. The smallest truck delivers up to 7 cubic yards of lightweight material and weighs up to 14 tons. The medium truck delivers up to 15 cubic yards of lightweight material and weighs up to 24 tons. The larger truck delivers up to 18 cubic yards of lightweight material and weighs up to 27 tons.